Social Defender is a user-friendly social media management tool designed to provide social media newbies and professionals with the ability to manage multiple social media accounts simultaneously. Through this platform, businesses and marketers will gain valuable insights and accurately measure social media efforts, which is crucial for overall success. 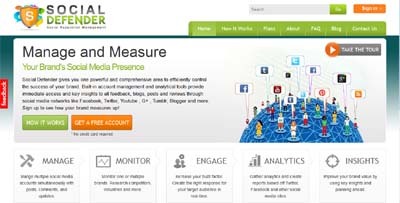 Social Defender connects all established social media networks – Facebook, Twitter, Tumblr, YouTube, G+, Pinterest, Blogger, blogs, and forums – into one manageable area. This single solution allows users to determine and analyze customer needs while monitoring, responding to, managing and analyzing accounts. The listening platform allows marketers and business owners to analyze what is being said online about a brand, service, industry, and competitors. The analytics provided may be incorporated with future goals and business plans. The workflow feature allows for multiple team management, without giving full administrative control. Team members can be assigned to monitor pages in shifts, so security and spam can be controlled 24/7. Other account management tools that are currently available do not connect to more than just a few networks or provide valuable insights. Most of these tools are used for merely managing accounts on a couple social networks or multiple accounts on a single social network. Social Defender has the competition beat in this aspect. On top of that, we provide insights. Besides offering more convenience than our competitors, we also present our users with valuable and telling social media analytics gathered from all connected accounts. Social Defender makes the process compact and easy for those that need an easier and more efficient way to handle and evaluate social media efforts.